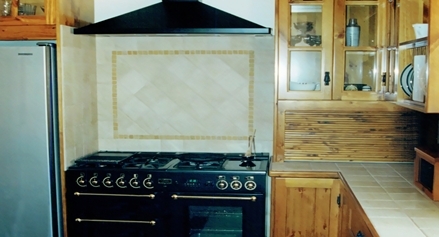 Spacious Farmhouse Kitchen with genuine Baltic Pine. 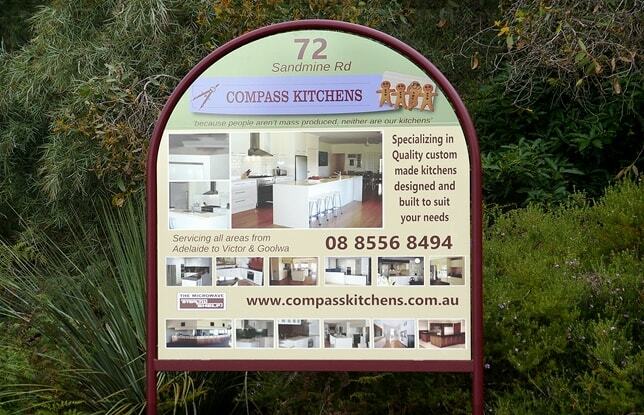 Our client here built a new country style home overlooking the catchment area of the Myponga Reservoir. 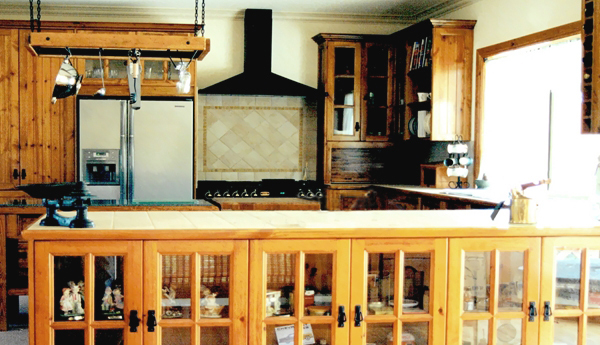 With a love for fine wines, good food, and passion for cooking our client required us to design and build a spacious, well laid out kitchen that featured lots of easy to access storage space with a functionally flowing work space. 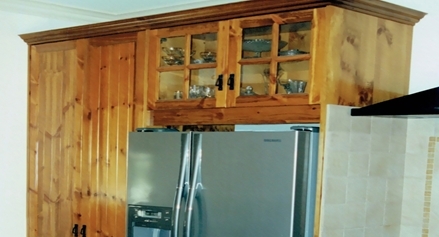 In keeping with this typical Country Style home, we incorporated elements that included V Joint Shaker Panel Doors in a distressed Baltic Pine, we included 16 Fully Extending Drawers with quality Blum Runners and designed plenty of feature Glass Doors in the cabinetry to display our clients vast array of crockery and collectibles. 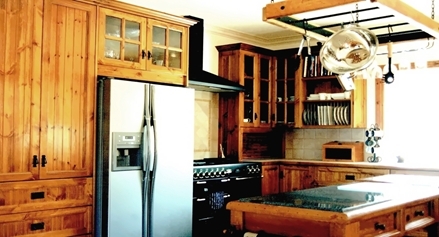 Along with their antique Butchers Block and hanging wrought-iron smallgoods rack we introduced elements in their design that included a black double AGA oven by Falcon with a combination of both Gas and Electric cooktops; all very much in keeping with this country style and its location. 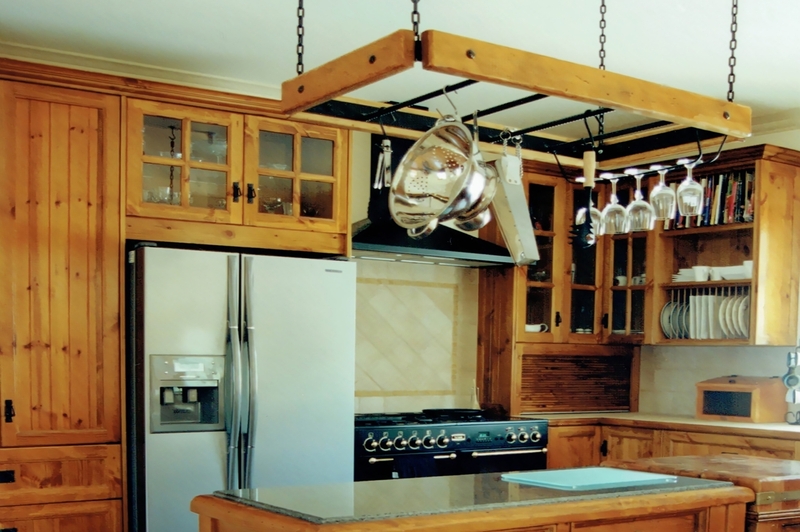 For our clients we included in their design a built-in a dishwasher, an Appliance cupboard with timber Tambour roll front, wine racks and open book shelves for their favorite recipe books as well as vertical farmhouse plate racks. 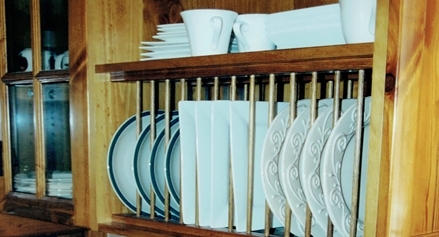 Our plate racks have a discrete design, where they can be removed from the cabinet, allowing for easy cleaning. Our client had selected Travertine Stone tiles for their benchtop where we custom made their bench dimensions to suit and edged this with Baltic Pine. As this room was split-level; dropping down into the family living area. 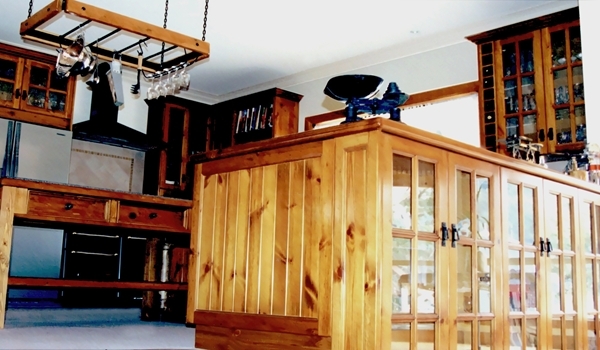 We were mindful of bringing the two areas together and so here we extended the kitchen peninsular Benchtop over into the lounge space and then stepped this down with 300mm deep Glass Door Curio Cabinets on the living area side, whereby this functioning as a custom piece of country style furniture in the lounge.